www.runningcrazy.co.uk and www.runningcrazy.com are the running holiday specialists for Individuals, Clubs and Groups with great races all over Europe and an expanding programme. Thousands of runners have followed our formula and all have gone home happy! Take a look at the comments that some of them have submitted to our Testimonials. We are runners ourselves, and know exactly what you need for a great weekend. We are delighted and proud of our good reputation in the running world. We go the extra mile as standard. 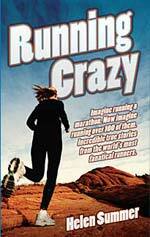 The basic 'Running Crazy' concept is simple...... you book and pay for your flights, and we arrange everything else. It is so convenient and easy to book flights to the continent nowadays, and cheap too - click on the links to the right and see for yourself. Alternatively use our 'Budgetair' search engine and see flight availability, prices and timings from your local airport. With this in mind we have designed breaks away to popular low cost flight destinations where there are very well organised events, where we have good links with the organisers, guaranteed entries, and hotels conveniently located for the race and also for your sightseeing days. Click on the race to the left for more details. Provided you travel to arrive anytime between the Thursday before the race and depart by the following Wednesday, we will meet you at the continental airport and have everything prepared for a great race weekend. Stays anything from 1 night to 1 week are possible - you choose. All you need to do is thoroughly enjoy yourself, and run as well as your ability allows. Many runners perform better at the after race party than at the race itself! Get a group together (10 or more) and there are additional benefits. These events make great club getaways - charities are approaching us more and more - and many groups return year after year! Why not join them? We believe these weekends are the best fun you can have with your running kit on! Enjoy your race, enjoy meeting new running friends, enjoy the party afterwards, and enjoy talking about your weekend until you return! 1. Choose the event you are interested in. 2. Complete and send the Application Form. 3. Await further information by return. To belong to the 100 Marathon Club you must have run 100 marathons or more. But who would want to run 100 marathons? And why? How do they find the time, the money, the energy? Are they crazy? If you have any comments on the races featured or events that you have taken part in, feel free to make a comment in our Guestbook. www.runningcrazy.co.uk and www.runningcrazycom are the © copyright of Malcolm Hargraves 2002-2017.